Bringing K-12, Industry, and Higher Education Together for Student Success. The Dual Enrollment Program at Madera Community College Center allows qualified high school students to earn college and high school credits at the same time while still attending High School. Dual Enrollment allows the Community College campus to form a partnership with local K-12 districts that enables high school students (9th to 12th) to take a college class at their high school for college credit. The high school student will be awarded both college credits and high school credit for the single course. Students are eligible for Dual Enrollment provided they complete the admission application online and have approval from the high school principal or their designee. Note: Not all high schools offer the opportunity for students to take Dual Enrollment classes.Students must first check with their high school counselor to determine if a Dual Enrollment class is offered at their campus. What are the advantages of dual enrollment for a student? In some cases, the student may be able to attain an associate’s degree shortly before or after their high school graduation. Participation in Dual Enrollment may ease the transition from high school to college by giving students a sense of what college academics are like. Dual Enrollment is a cost-efficient way for students to accumulate college credits because courses are paid for and taken through the local high school. The amount of work necessary to succeed in college level courses may be much greater than in high school courses. 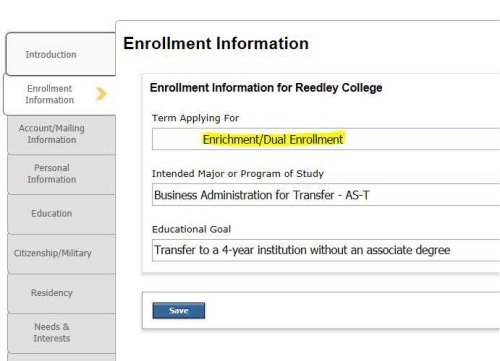 Dual enrollment courses become a part of a student's permanent college transcript and could impact eligibility for financial aid and admission to other postsecondary institutions. Most Dual Enrollment classes count towards general education college credits and graduation requirements for high school. If a student fails one of these classes, it will negatively affect their high school and/or college transcripts. If a student needs additional support to complete regular general education high school classes adding the additional strain of the college class may not be the best choice. Students need to consider future plans when deciding if Dual Enrollment is right for their situation. Students wanting to take Dual Enrollment classes must apply online. The table below will show you when Dual Enrollment application will open. To apply, please click on the application link listed below for the college where you will be attending and select the term which indicates Dual Enrollment. Dual enrollment students must also complete and submit the “Dual Enrollment Registration Packet.” This includes signed forms from parent and high school principal. To obtain a Dual Enrollment registration packet please talk to your high school counselor.